The following lecture comprehensively presents information regarding Tibiofibular Joint. 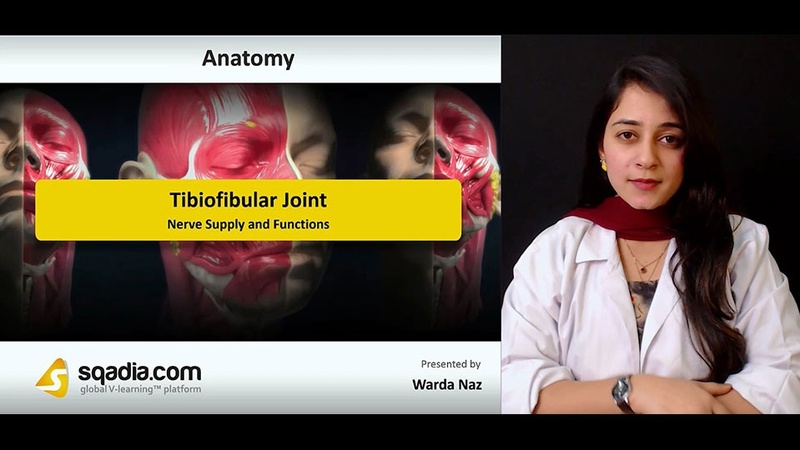 Section one of this lecture focuses on Proximal Tibiofibular Joint. The educator puts forth the Definition of Proximal Tibiofibular Joint in the beginning and then explains its Articulation. Later, the educator explains what Type of joint a Proximal Tibiofibular Joint is. In addition to this, light is shed on the Capsule and Ligaments of this joint. The prime focus of section two is the elucidation of Synovial Membrane and Movements of Proximal Tibiofibular Joint. The educator begins by demonstrating the Synovial Membrane. After this, the Nerve Supply is discussed. At the end of this section, the educator extensively talks about the Movements of Proximal Tibiofibular Joint. Section three covers the topic of Distal Tibiofibular Joint. The educator begins by explaining Tibiofibular Syndesmosis. Afterwards, the educator gives comprehensive information about Inferior Tibiofibular Joint and highlights its Articulation. Moreover, light is shed on the Type of joint the Distal Tibiofibular Joint is. At the end of this section, the Ligaments of this joint are explained in detail. Section four is about Nerve Supply and Functions of Distal Tibiofibular Joint. The educator gives a comprehensive overview of the Nerve Supply and talks extensively about Distal Tibiofibular Joint’s Movements. Later, the discussion shifts towards Function which is followed by an elucidation of Motions Available. The educator concludes this section by shedding light on Syndesmosis Ligaments Attachment. In section five, the educator reports Clinical Significance of Tibiofibular Joint. First of all, the educator focuses on the injuries of Proximal Tibiofibular Joint and provides a thorough overview of various Types of Dislocation that can occur in this case. Moreover, an insight into the Pathology/Injury of Distal Tibiofibular Joint is also provided. Apart from this, the educator talks about Clinical Conditions and brings the topic of Ankle Fracture under consideration.